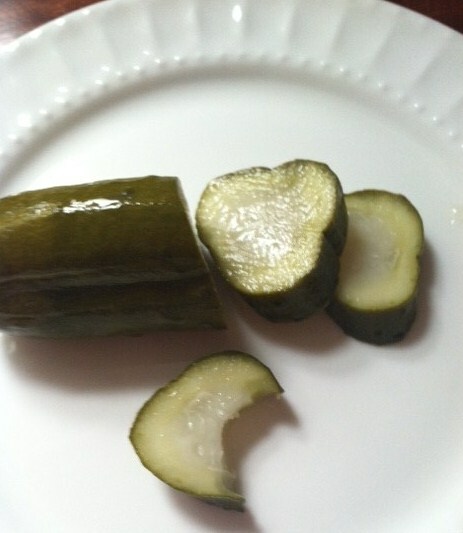 One of my favorite foods in life is the pickle! Yummy dill pickles! Back in college my friend Mary-Jo had us up to her parents cabin in Pennsylvania for the weekend every summer and every year she would bring her fathers home-made pickles. They were so delicious they wouldn’t even make it through the first hour. We begged her for the recipe but no luck…until about 10 years ago we had a sort of reunion and went up for a last hoorah because they had sold the place and at long last she shared the recipe with us. So I have had the recipe sitting in my recipe box all this time and have never tried it out;until now and I am sharing it with you because it is so easy and so good! In a large pot bring the water, vinegar and salt to a boil. While waiting for the liquid to boil, wash the cucumbers and put in jars. 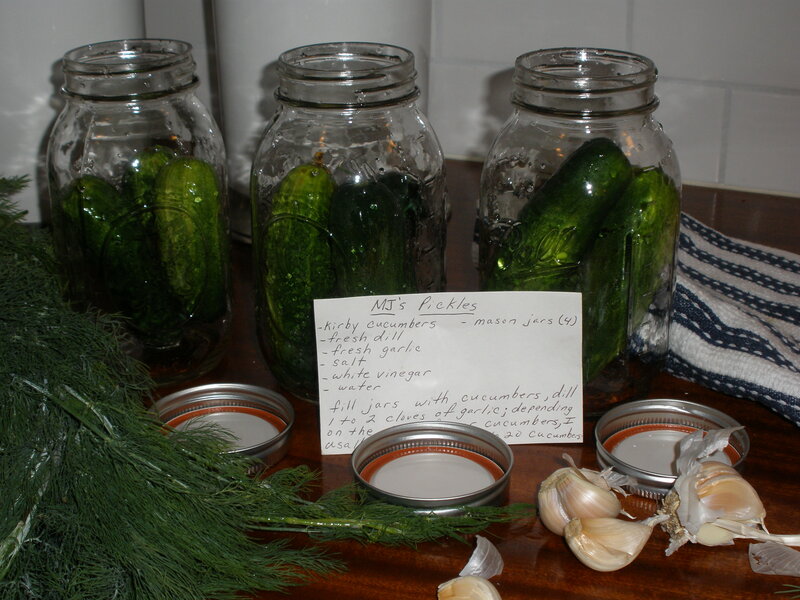 Add about a handful of fresh dill and 1 or 2 large cloves of peeled garlic to each jar. Use your judgement when it comes to the garlic-I did some jars with more and some less so I could see what I liked better. When the liquid comes to a boil pour into the jars until covering the cucumbers, put the covers on each jar loosely and put aside for 10 days. Yes, mine sat on my counter for 10 days and we could smell the faint fragrance of the vinegar mixed with garlic and dill, then on the 11th day tighten the seals and refrigerate. Then EAT! I got rave reviews from my co-workers, my husband and even my dog! As for the garlic, the general consensus was, the jars with more garlic were tastier. I hope you won’t wait as long as I did to make these, they are too good! 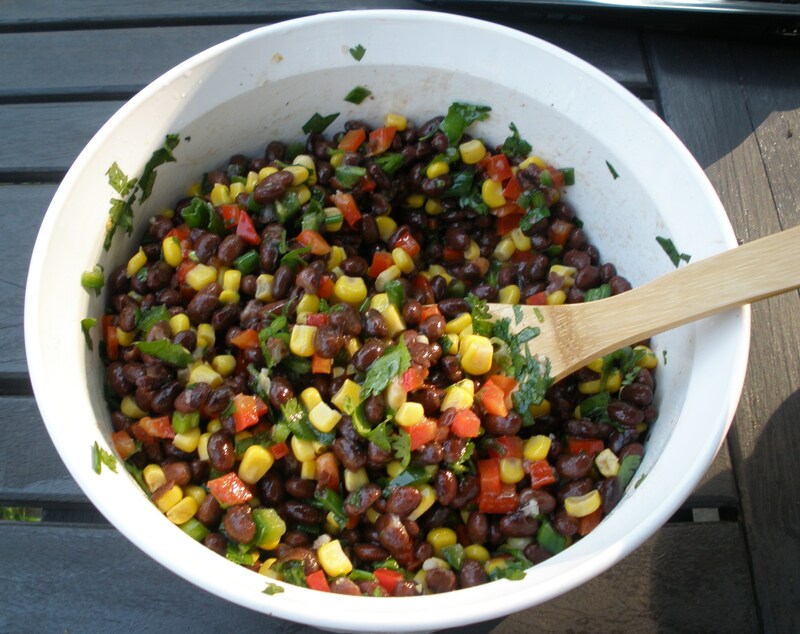 Here’s great salad recipe that is not just yummy but healthy and gluten free! It ‘s another one of those that I am asked to make again and again….it goes really well with just about anything- burgers, steak, chicken or even grilled shrimp. My husband actually likes to put it in a tortilla and eat it like a burrito, I prefer it naked- it’s too pretty to cover up. In a bowl combine all of the ingredients and stir to mix well. Season to taste with salt and pepper and set aside to let side for at least 1/2 hour before serving. ENJOY! Happy Easter Everyone! My favorite holiday. Some people are surprised to hear that, but it’s true. The pretty pastel colors, baskets filled with goodies, bunnies and the fact that spring is here and the trees and flowers are blooming-that is why I love it. And the fact that a big meal with great food is involved also makes it a favorite. 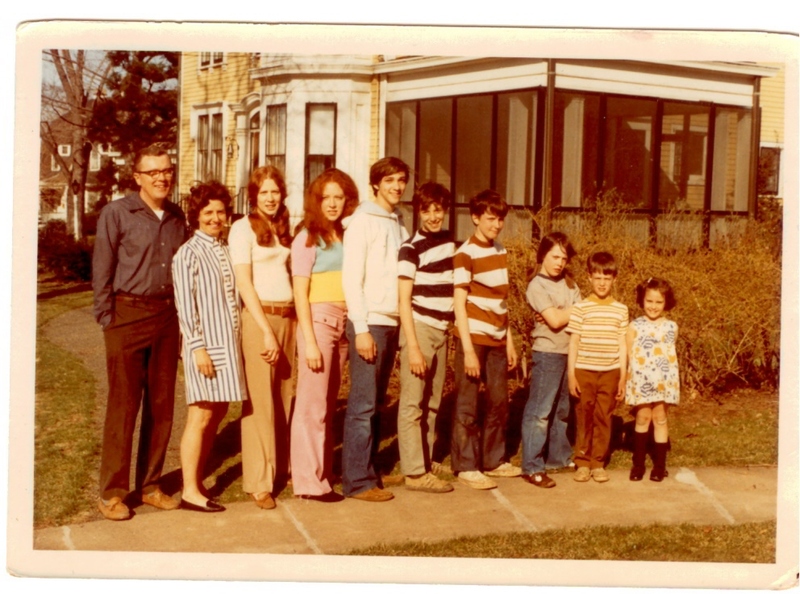 In my house growing up we usually had 2 big meals for Easter-breakfast and dinner. Now with everyone having their own families things are different, my husband and I go to his mother’s house where we have their traditional meal of breakfast and dinner together. Yep, that’s right breakfast and dinner in one meal, it was his fathers doing and they have kept the tradition going now for years. It consists of everything from a turkey and ham to fried eggs, stuffing and hash browns. You never leave hungry. 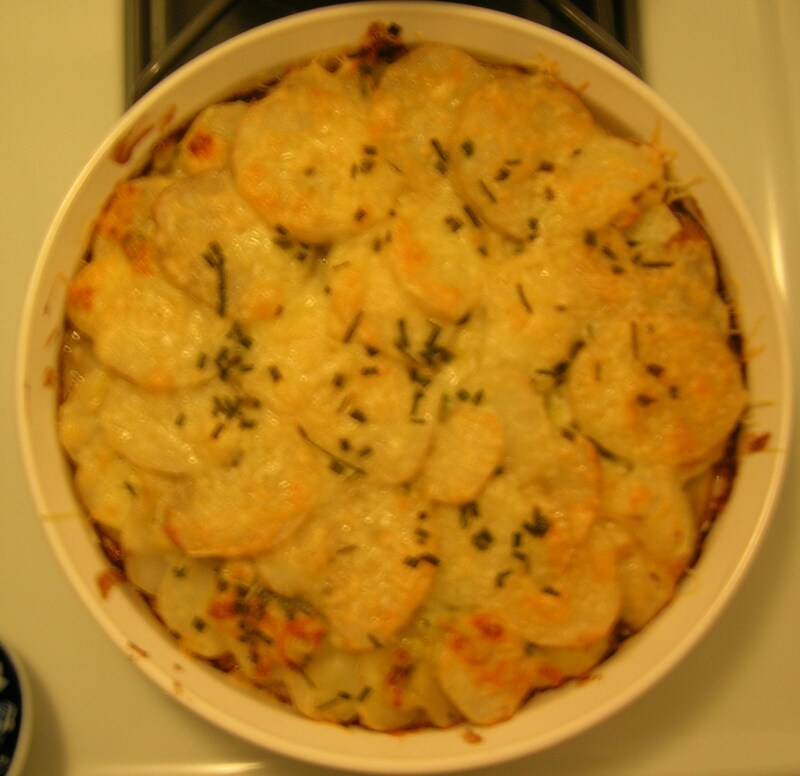 This year I wanted to do an “Easter” dinner for my husband and I last night, but wanted to do a little something different and while going through my recipe notebook I stumbled upon a recipe for Potato-Leek Gratin that I had ripped out of a William-Sonoma catalog. 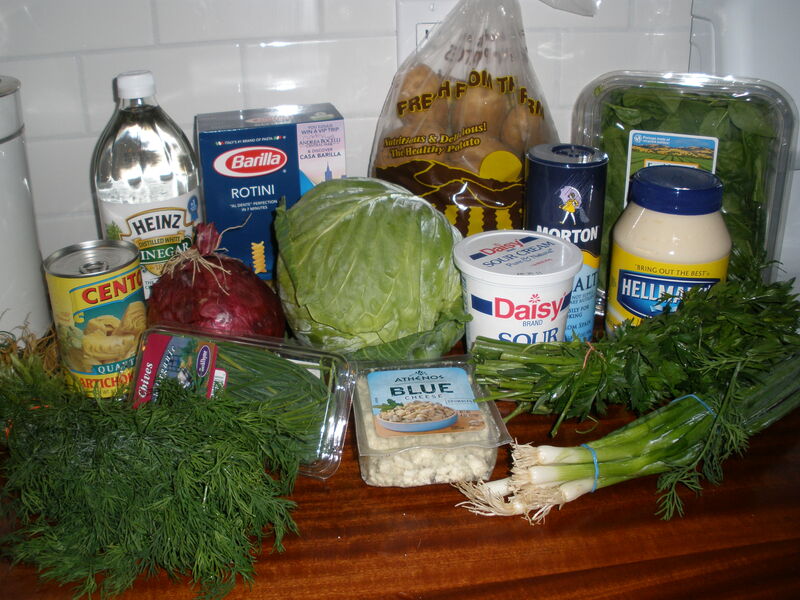 So off I go to the super market to get the ingredients. This dish required quite a bit of cooking time so while the ham was baking I started to make the gratin and when I went to grate the cheese I realized I bought Gouda instead of Gruyère-UGH! So, with leeks all set and the potatoes sliced, off I go to the market again! I had thrown my receipt away but the woman was kind and took pity on me as I told her I was in the middle of cooking and she let me exchange but they were out of Gruyère, how does that happen!? Not really sure what to do I grabbed a block of swiss somehow remembering that Gruyère is in the swiss cheese family and a block of monterey jack for its creaminess-it will have to do. Well, let me tell you that it was amazing! One look at my husbands face as he ate the steaming hot mass of what we call cheesy goodness was all I needed. Try it for yourself and you too will be amazed. Just one thing about the recipe that I didn’t do was add the nutmeg, just didn’t seem like it fit. In a 12″ nonstick fry pan over medium heat, melt 4 Tbs butter. Add leeks and salt, stirring to coat leeks with butter. Cover and cook, stirring occasionally, until leeks are tender, about 20 minutes. Add thyme, nutmeg, pepper and cream. Simmer, uncovered, stirring occasionally until thickened, about 15 minutes. Transfer to bowl; let cool. Wipe out pan; grease with 1 Tbs butter. In a bowl combine cheeses. Layer one-third of potatoes in fry pan (I used a casserole dish-much prettier). Spread one-third of leek mixture on potatoes. Sprinkle with one-third of cheeses then 1 Tbs chives. Repeat layering 2 more times, reserving 1 Tbs chives. Cover pan; transfer to oven. Bake 45 minutes. Remove lid;bake until potatoes are tender and crust is golden brown, about 30 minutes more. Sprinkle remaining chives on top, let stand 15 minutes before serving…or try to anyway. Serves 8 to 10.